What’s happening at Motopark this weekend? The weather looks great this weekend, April 22 & 23. The track should be in great shape both Saturday and Sunday. Rentals are available. Hotel Rooms are available. Send us an email to info@motoparkracing.com to book. 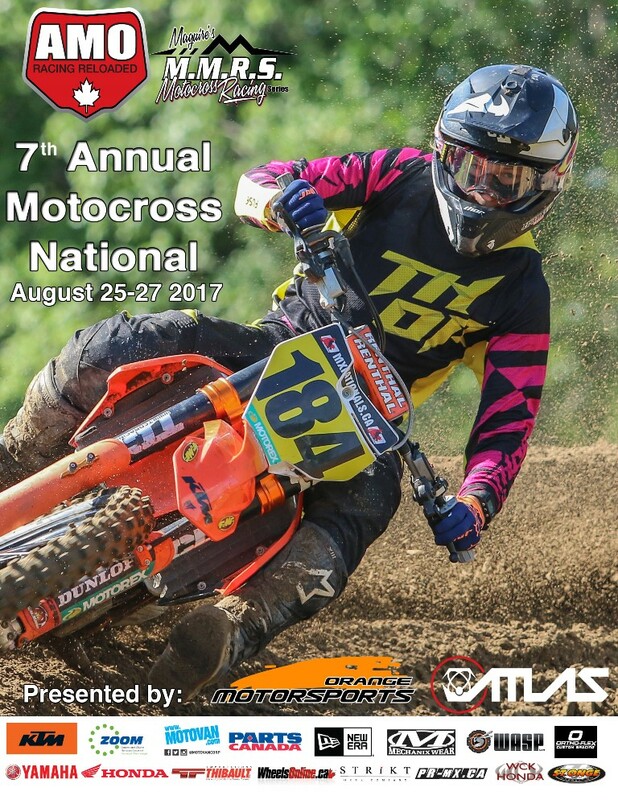 The Motopark Cup races will return for the 10th year in 2017. May 20 & 21 and July 1 & 2 are the dates for these events which have grown to become two of the most prestigious events in Canadian Motocross. Two new events have been added this year. The Huckabucka Slam takes place on the August holiday weekend. A family fun weekend with a different take on moto fun. Saturday sees lots of practice and fun events leading into an entertaining evening. The races on Sunday feature three completely different motos per class highlighting a riders speed and endurance. Classes will be limited making for a more relaxed atmosphere and lots of seat time. Huckabucka Slam takes place on August 5 & 6. Saturday from 9am to 3pm is regular practice and from 3pm to 6pm is timed qualifying. Sunday each class races 3 motos. Moto #1 – 2 lap sprint, Moto #2 – 5 laps, Moto #3 – 10 laps. Adjustments may be made to the schedule the day of the event. War of MX – The Vet National takes place Saturday October 7. What better place to hold a true Vet National than historic Motopark. 2017 marks our 45th year of operation and starting at this event, we will be celebrating our anniversary each year with a free dinner, early Saturday evening for all the riders, crews and campers attending the event. A number of special guests will be in attendance this weekend and you know that Motopark will provide a great event for our Veteran motocross riders. 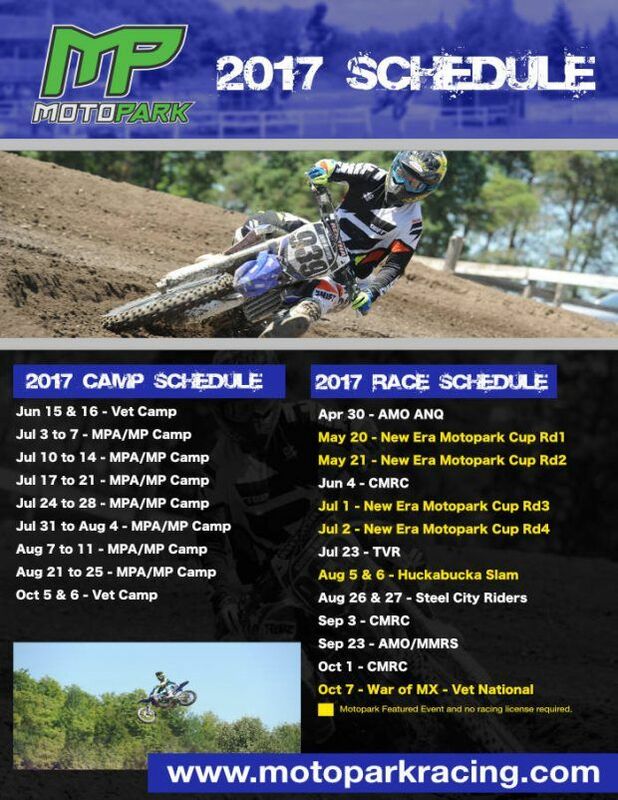 Motopark also sets 5 weekends a year aside for various groups and associations including AMO, CMRC, MMRS, TVR, and Steel City Riders. Rentals & Day Training – Motopark will continue to offer Yamaha motocross and trail bikes for hourly and daily rental in 2017. Day training for beginner, trail and motocross riders is also available. Hotel Units, Camping, Restaurant – Motopark’s facilities are available for use by Members as well as visitors. The Off-Road Café features great food and a comfortable sitting area overlooking the track.